Dr. Jose A. Berrios received his medical degree from The Universidad del Caribe School of Medicine in Cayey, Puerto Rico. Dr. Berrios did a surgical residency in Cleveland, Ohio. He studied Otolaryngology- Head and Neck Surgery, Facial Reconstruction and Facial Plastic Surgery at Wayne State University School of Medicine in Detroit, Michigan. Dr. Berrios was fellowship trained in Pediatric Otolaryngology and Facial Reconstruction at Albert Einstein School of Medicine in Bronx, NY. Dr. Berrios was in private practice in New York before relocating to the Tampa Bay area in 1988. He is an Associate Professor at University of South Florida. 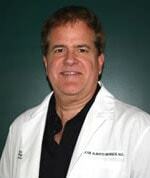 Dr. Berrios has privileges at Florida Hospital North Pinellas and Country Side Surgery Center. He is a member of the American Academy of Otolaryngology-Head and Neck Surgery, the American Medical Association, Florida Medical Assocation, Network of Florida Otolaryngologists.